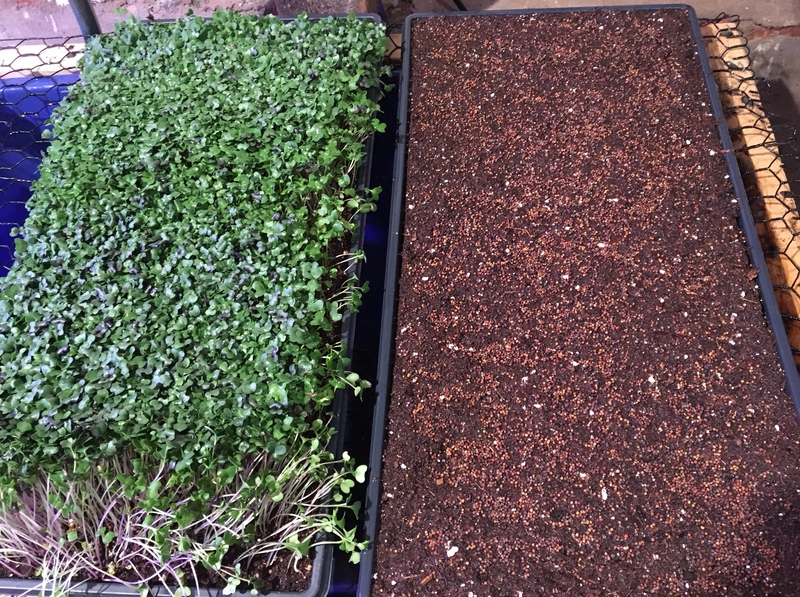 One of our most exciting new ventures on the farm this year has been growing micro greens. As we continue to try to identify and establish markets for our micros, we’ve found that quite a bit of education of consumers is needed. So here’s the deal with micro greens. Micro greens are immature versions of the fully grown plant. Most of our micro greens are harvested within two weeks of being planted. Most are still in what is called the “cotyledon” stage, which means that the plant hasn’t even gotten its first “true leaves.” These little beauties are jam-packed with flavor, and perhaps more importantly, all the nutrition in that seed that was intended to help the plant fully grow. Studies have shown that micro greens are loaded with nutrients, such as vitamins C, E, and K, lutein, and beta-carotene, 40 times that of the mature leaves of the same plants. At this moment, we are growing a “mild micro mix,” which is a mix of all sorts of vegetables like kale, cabbage, broccoli, and others in the brassica family. We also have a “spicy micro mix,” which has lots of mustard greens, arugula, and an assortment of asian greens. Then we do sunflower and pea shoots as well. Right now, we’re growing all of our micro greens inside under grow lights. We start the seed in 1” deep trays, water them in, and then let them do their thing. Because they are so densely planted, there are a few things we need to really watch. Disease and fungal issues can become a problem when plants are grown so tightly together. We help with this by keeping a fan running all the time to increase air flow on our plants. Watering is also key. We hand water twice a day, and if we forget to do it, we can usually notice a reduction in our yields. With only 10-14 days in the soil, every day really does count. For our micro mixes, we just plant them densely, water them in, and keep them dark and moist until they are germinated. The sunflower and pea shoots require a little different setup. We soak these seeds for 8-10 hours, and then sterilize them with white vinegar and food grade hydrogen peroxide to reduce fungal issues. Then we seed the trays and stack them up on top of one another. We put a 5-10 weight on top of the trays, and let them sit like this for a few days. The weight increases seed to soil contact and helps them germinate more evenly. The plants will literally lift the weight up. In fact, one time I left them stacked a day too long and the plants had pushed up so much that they knocked the weight over onto the floor. So how do you add micro greens to your diet? We put the mild and spicy micro mixes on just about everything we eat. Eggs, meat, pasta, salads, and the list keeps going. We add the sunflower and pea shoots to salads, and sometimes use them as a substitute for lettuce on sandwiches and wraps. The sunflower shoots can also be cooked gently and added to stir fries. We have a lot more experimenting to do with micro greens. There are hundreds of flowers and vegetables that you can grow as micro greens, so we have a lot more playing around to do as we learn more about growing this product. If you’re interested in trying them, you can currently purchase our micro greens at Green Top Grocery in Bloomington, IL.